Your hairstyle has the ability to completely change and enhance the shape of your face. Once the scissors attack, though, there’s no going back. It can take months to return your hair to its former glory, and it’s just rude to wear a hat indoors. These 10 Kens, on the other hand, definitely know how to rock their fabulous hairstyles. 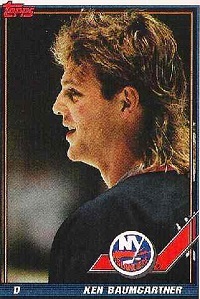 The Hockey Mullet – Now retired, Canadian hockey player Ken Baumgartner famously sported a blond-tipped mullet through much of his career. The Mullet may have gained notoriety when it was the coiffure of choice for country star Billy Ray Cyrus, but Mr. Baumgartner made it part of hockey history. The Director’s Cut – Ken Olin often comes across as a middle of the road actor, which is probably why he never seems to deviate from his trademark middle-shade haircut. The parting may shift, on occasion, but Olin’s style seldom errs very far from a Hugh Grant-esque, floppy mop of delightfully messy hair. Behind the scenes, Ken is also an accomplished producer, so perhaps he reserves his more adventurous hairstyles for the big chair. Kenny the Hedgehog – Before his major role in the hit series “Lost” as Miles Straume, Ken Leung played the part of Kid Omega in X-Men: The Last Stand. For some reason, the makers of the movie decided to depict him as the hedgehog version of the character, with long spines protruding from his face and head. Despite the frightening appearance, Leung actually pulls off the look quite well. The Spike– As professional wrestlers go, Ken Anderson was always hard to take seriously. From his habit of snatching the announcer’s mic so that he could provide a long, drawn out introduction for himself to his blonde-tipped, spiky hair, Anderson was a caricature of a wrestling heel. However, his ability in the ring soon put to rest any doubts as to whether or not he was the real deal and the hairstyle went down in history. Teenage Terror-Hawk – When you’re playing a leading role in a show like “The Secret Life of the American Teenager,” you’ve got to look the part. It is surprising, then, that Ken Baumann insisted on wearing his hair in a high-top, ‘80s style. What’s even more surprising is that he’s managed to make it look effortlessly cool. Ken Dodd – The only entry on the list who is credited with his actual name, Ken Dodd is instantly recognizable by his crazy hair and zany comedy. Dodd is a much loved television entertainer in the U.K. He is the king of rapid-fire comedy, as he streaks across the stage delivering funny one-liners with his wild, fuzzy locks flowing behind him. Fringe Burns – Ken Burns has made some of the most critically acclaimed documentaries in the 20th and 21st centuries. His haircut, however, looks more like he picked it up in the 15th or 16th century. The director favors the straight fringe and bowl cut, often accompanied by a goatee beard. It does suit him, and if his directing career falls upon hard times, he’s a great candidate for a job at Medieval Times. Killer Hairstyles – As Jason Voorhees in the Friday the Thirteenth films, the audience doesn’t typically get to see the killer’s hair. In some installments of the franchise, he is completely bald, whereas in others he has long, single wisps of hair. Regardless, Ken Kirzinger is one of the few actors to play the character with hair. Curled to Cropped – Kenneth Marshall started out his career in such movies as Krull with a tight mop of curls. As the actor aged, his curls seemed to loosen somewhat. By the time he played Michael Eddington in the series Star Trek: Deep Space Nine, Marshall was starting to lose his once luscious locks. The actor is now sans hair, but still looking good in his 60s. The Inside Job – As a famous hairstylist, Ken Pavés has had some interesting haircuts. The thing is, they all seem to take on a variation of the long, straight and feathered look. It doesn’t matter, though, as Pavés is rarely seen without a starlet from the music or movie worlds hanging on his arm.